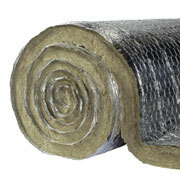 PAROC Hvac Fire Mat AluCoat is a non-combustible stone wool wired mat. It is used for thermal and fire insulation of circular and rectangular ventilation ducts. It has a reinforced aluminium facing.